The simple idea at the heart of expressive organizing is that people experience the organization’s core purpose in their daily work. Over time, that experience, though imperfect and often challenging, can become widely shared and sustained. The pattern becomes resilient enough that everyone who interacts with the organization can feel it to some degree. But how do we sustain an experiential pattern? We know how to sustain visible structures and behaviors. Rules and customs serve that end perfectly well. But our experiences are peculiar to us and markedly variable. An activity that one day enlivens us might the next day provoke nothing but fatigue. How do we structure an organization so that people reliably, if not perfectly, experience things like community, creativity, justice, growth, and compassion? Well, it may sound obvious, but one important, practical thing we have to remember is that in order to sustain an experiential pattern, we have to have access to each other’s experiences. We have to know at least something about how our various organizational forms and behaviors are making people feel. This is why, I think, that the most deeply engaging organizations I’ve encountered seem to be rooted in small, daily acts of personal revelation. I’m not talking about pouring out our darkest secrets to each other. By ‘revelation’ I mean simply an accretion of simple glimpses that people offer each other into their inner states – their ideas, emotions, curiosities, histories, likes, yearnings, confusions, etc. I’ve taken to calling this kind of revelation ‘inscaping’ – borrowing the term from the poet Gerard Manley Hopkins for whom ‘inscape’ represents the fundamental inner shape or essence of any object – that which makes something both unique and reflective of a larger whole. People in expressive organizations seem to develop many modes of inscaping. They might do check-ins at the beginning of meetings. They might share highs and lows. They might simply be in the habit of changing the tenor of a conversation by expressing how they are feeling at the moment. Inscaping happens when I tell you something about my inner state. 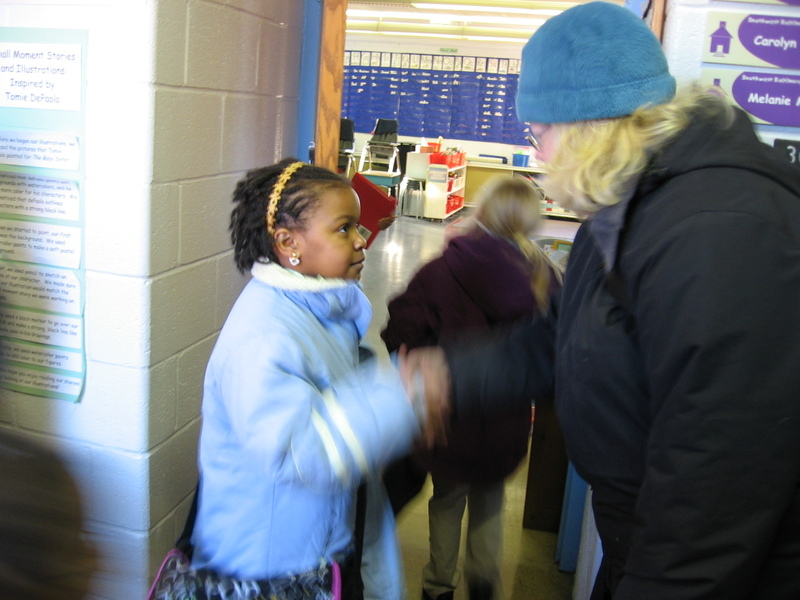 One of the most beautiful practices at the school is that as the students line up outside of their classrooms each morning teachers greet and touch base with each child individually. They shake hands or give a hug. They ask how the child is doing that day. They might even share how they themselves are doing. Inscaping seems to breed itself. A little bravery here, a little surprising acceptance there, and people grow more and more comfortable with the idea that our inner lives are part of our outer work. And this in turn deepens the expressive capacity of the organization. Connecting to each other in this way allows us to breech our stiff role boundaries, making it easier for us to receive the gifts the organization has to offer. At a workshop on expressive change that I gave to a group of senior health care professionals, one doctor talked about how it had always been his practice to tell his patients about his own life. He said that this strengthened his connection with them and in some sense allowed them to tend to him even as he was tending to them. When he was struggling with his mother’s illness, for example, patients coming to him with illnesses of their own would ask about her and offer him kind words. Though they were not treating him medically, they were part of his healing as he was part of theirs. One of the most important things I have learned about inscaping is that it happens primarily in and through the organization’s work itself, not through separate retreats and workshops and interventions. In an expressive organization, sharing our inner lives is not something we do at odd times just to strengthen our work. It is part of our work. We know that how we experience our work ultimately governs what our work can become. The Food Project, an ambitious Boston-based project in youth development and sustainable agriculture that I visited some time ago, is anchored in what they refer to as ‘straight talk,’ a conscious style of communication that emphasizes frankness and authenticity and moving beyond the accustomed “stories” people use to frame their identities. I was struck by how this practice of straight talk was embedded in the actual, detailed context of the work. People didn’t just talk about themselves. They talked about turnips. Teenagers enthusiastically explained “cover crops” to me. Rye, apparently, is particularly good at replenishing the soil. They talked about “putting the land to sleep” during the winter. They told me about “the three sisters” – squash, corn and beans – and about how the squash leaves provide shelter and protection for the bean sprouts until they are strong enough to begin growing up the stalks of corn. They know how to grow and harvest and cook and buy and sell. The work becomes a way to connect and to grow, and so the work itself, suffused with energy, thrives. I have found this same focused passion for the details of the organization’s work in other places where inscaping is a common practice. The Food Project won a diversity award for its ability to bring together youth from different backgrounds and races. When one of the award officials was touring the organization, he was struck by how different it was from all the other programs that had won the award. The other groups were almost exclusively focused on dialogue. The Food Project, he said, was the only program where people were “actually doing something.” Inscaping, rather than distracting us from our work, can connect us to it in ways that we can’t envision when we leave ourselves at the door to focus instrumentally on only the task at hand.